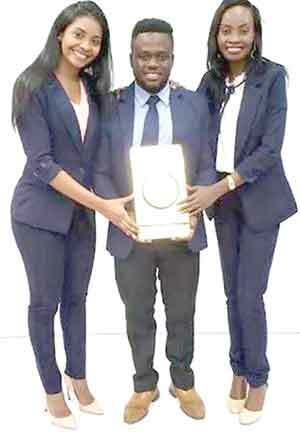 The University of Guyana (UG) carted off the prize for best academic institution after emerging as the runner-up when the Caribbean Court of Justice (CCJ) eleventh annual international law moot concluded last week Friday at the court’s Trinidad and Tobago Headquarters. The University’s team comprised of Law faculty students Ms. Shameza David, Mr. Reon Miller and Ms. Cassandra Jaikaran. Their advisor was former Chancellor of the Judiciary Carl Singh, who also heads UG’s law department. Reacting to the outstanding achievement, Miller said, “For 10 long weeks, we worked to prove to the Caribbean Community that the University of Guyana is not a back alley institution. From the 14-hour long practice sessions and the constant feeling like our argument wasn’t good enough, two second and a first year student beat the odds. Meanwhile, the Hugh Wooding Law School bested eight other schools to take home the CCJ Challenge Shield as winners of the competition. The moot was held through March 21 and 22 and was heard by a panel of three CCJ judges, David Hayton, Jacob Wit and Winston Anderson. Each year, the moot aims to give students grounding in the Court’s Original Jurisdiction, where the CCJ is the guardian of the Revised Treaty of Chaguaramas. This year’s fictional question centered on a dispute where Suriname was alleging breaches of the Treaty caused by the treatment of a couple in a manner amounting to discrimination on the grounds of nationality. The event also helps students to develop practical courtroom and advocacy skills. The moot also featured presentations from the Norman Manley Law School (Jamaica); Faculty of Law of the Anton de Kom University of Suriname; Faculty of Law of the University of the Bahamas; Faculty of Law of the University of Technology, (Jamaica); Faculty of Law of the University of the West Indies – Cave Hill; Faculty of Law of the University of the West Indies, Mona and Faculty of Law of the University of the West Indies, St Augustine.